OfficeDesigns carries only top-tier, ergonomic products which are always created by world class designers. As an Official Retailer, we strive for customer satisfaction: Design, Function, and Sustainability. The 111 Navy Chair is a story of good old-fashioned American innovation. 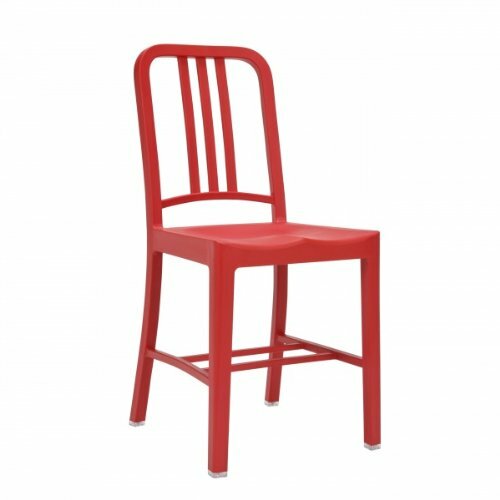 In 2006, Coca-Cola approached Emeco to solve an environmental problem ÛÓ taking recycled Coca-Cola bottles out of the landfill and “upcycling” them into an iconic structural item, made to last. It took years to develop the new material that is now used for the 111 Navy Chair. Emeco committed to the challenge, taking soft recycled PET plastic, originally intended for short-lived fabric and textiles, to OfficeDesigns carries only top-tier, ergonomic products which are always created by world class designers. As an Official Retailer, we strive for customer satisfaction: Design, Function, and Sustainability. Comes with manufacturer’s warranty.